Pinterest has the exponential power to share your content across the platform, but there are a few things you need to do to optimize your repins. In this blog post, I’m sharing 5 ways to get more pins (or saves) on your Pinterest pins! Pinterest is most interested in content that solves a problem for the pinner. Want the farmhouse look? Pinners hop onto the search bar and search ‘farmhouse style.’ Instant results! Which pin will they choose? They will most likely repin clear, crisp imaged-pins with text overlay showing the pinner how to get the ‘farmhouse look.’ Make the pin convey an action to take with a call-to-action! The preferred size for the Pinterest platform is a 2:3 ratio, or 600 x 900px. Don’t be tempted to create ‘giraffe pins’ as they are called. Secondly, most Pinterest users are using mobile, so make sure the text overlay is easy to read with clear and large texts. You can read more about text overlay on this post! Pretty inspiring pins get more saves! Not a graphic designer? There are some visually attractive options and templates on Canva. Keywords are everything on Pinterest as a discovery platform! Use 2-3 keyword-rich sentences with hashtags for the best chance to rank in the Pinterest search feed, ultimately getting more repins! Want more keywording tips? Check out this post here. Sometimes the best content strategy is to find out what received the most repins in the past! Take a look through your Pinterest or Google analytics and create content based on your top performing posts. Get more ideas here. Tip 5: Make sure your website is Pinterest-friendly! This step is so important! If you aren’t optimizing your blog posts to encourage pinners to repin on Pinterest, then you are missing a huge opportunity to drive traffic to your site. Make sure you have ‘pin it’ buttons on your Pinterest optimized images to make it easy for blog readers to pin. 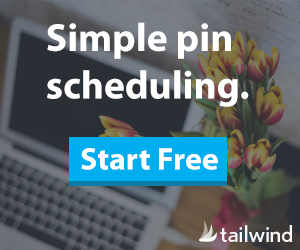 ‘Fresh’ pins pinned straight from your site, uploaded directly onto Pinterest, or pins scheduled from Tailwind get more priority in the Pinterest smart feed than repins on Pinterest. Ready to optimize your blog posts for Pinterest? Grab my How to Create a Pinterest-Friendly Blog Post E-Guide!